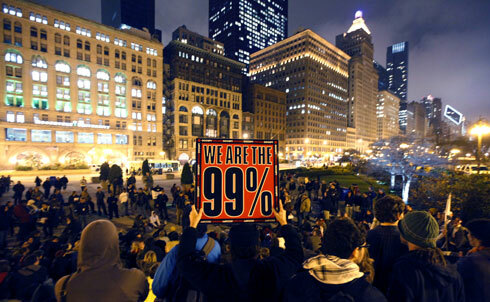 Last month, The Nation reported on nine cities in which the Occupy Wall Street movement had really taken hold. As the weeks have worn on, many cities have faced a crackdown from local police as well as dropping temperatures across the country. Nevertheless, the occupations in these cities, from Los Angeles to Boston, are now only more entrenched and are coming up with ingenious solutions to remain a powerful force on the national political scene—not to mention weathering the winter cold. 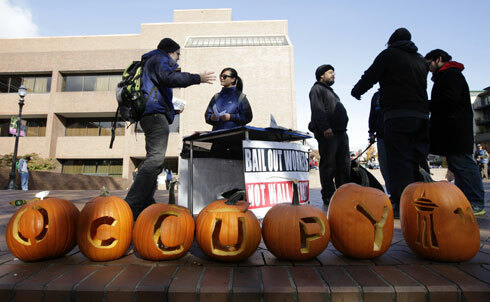 On its side of the bay, Occupy San Francisco has expanded significantly, from an initial gathering of fifty-odd campers in front of the Federal Reserve Bank downtown, into a “decentralized” presence in the city. They’ve established a second encampment of 100 to 300 occupiers at Justin Herman Plaza on the Embarcadero, and hope to expand to a third camp at Civic Center. 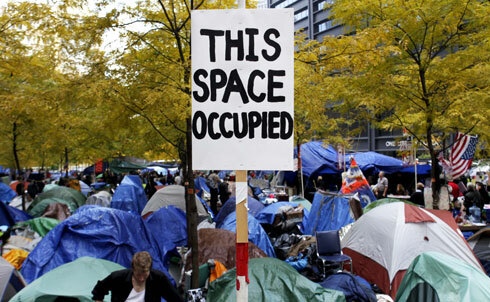 Two mass arrests of Occupy Chicago protesters in mid-October obliterated the much-lauded mutual goodwill between city law enforcement and the movement, according to Occupy spokesperson Dan Massoglia. The arrests occurred as large groups of protesters attempted to camp out overnight in Grant Park, a public space with a city curfew. Massoglia says some Occupiers were denied phone calls, food, water and medicine while they were held in jail. These arrests stem from what remains Occupy Chicago’s most urgent task: finding a home. Though stationed at the corner of Jackson and LaSalle in the heart of Chicago’s financial district, police have told the group to remain mobile and to keep their supplies on wheels. The group’s internally controversial list of demands has not been voted on, and talk of a Spokes Council proposal is still informal. As the bitter Midwestern winter approaches, Massoglia says that the group’s main focus is on whether or not to maintain a full-time outdoor presence. Massoglia says the group’s influence could grow throughout the city and suburbs if the movement takes on a roving form over the cold months, exemplified by a recent action in which protesters “mic checked” visiting Wisconsin Governor Scott Walker at a closed event. With winter approaching, the camp is now deciding how to face the cold. The winterization committee is currently searching for indoor locations suitable to host the General Assembly and other meetings. For those choosing to remain in their tents, says organizer Eric Martin, “the most valuable thing we can offer them is knowledge.” Committee members are currently drawing from the suggestions of survivalists, the homeless and even MIT students in their attempts to keep warm. The two occupations in Washington, DC, both have had to endure the cold, tensions from the city police, as well as disagreements with one another. Occupy DC protesters at McPherson Square off of K Street still have their generators, including gas-charged generators for their kitchen and hot plates for their meals. While the cold front has certainly ensured that both Occupy DC and the Stop the Machine occupiers at Freedom Plaza off of Pennsylvania Avenue remain in their tents at night, both occupations’ numbers remain at a fairly consistent level of more than seventy Occupiers in the late evenings, with their numbers swelling during the days and especially during protests. The McPherson Square crowd’s relationship with the police has become tenuous after the November 4 protest against the Koch brothers–funded Americans for Prosperity event at the Washington Convention Center. 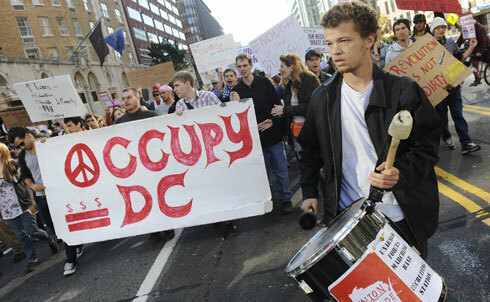 Members of both Occupy DC and STM blocked traffic on all the major intersections around the center, preventing conference attendees from leaving. During the protest, a driver struck three protesters who were blocking an intersection with other activists. Protester Heidi Sippel temporarily lost consciousness and the car grazed her pregnant wife and son. The police did not arrest the driver because they said he had a green light, but they did give the Sippels citations. In the month since the first smattering of Occupy LA protesters set up camp across the street from City Hall, their encampment has grown into a tent city of an estimated 700 people, sent its media team north to bolster the beleaguered protests in Oakland and become one of the largest and most peaceful Occupations in the country. That’s not to say that it hasn’t had problems. 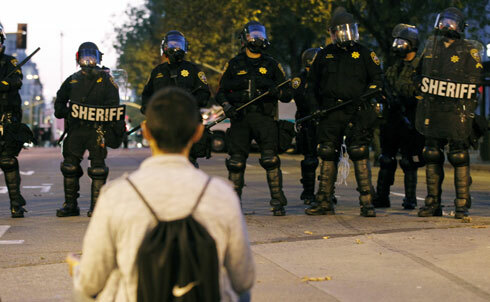 Only a few weeks after publicly supporting the movement—and handing out 100 free ponchos to protesters during a rare stint of bad weather—Los Angeles Mayor Antonio Villaraigosa stated that the Occupation “cannot continue indefinitely.” More seriously, a woman was removed from the area last Friday for lighting another protester’s clothes on fire; within hours, a second woman was arrested for hitting a fellow Occupier with a tent pole. And due to its proximity to Skid Row and because of the movement’s emphasis on those hardest hit by the tough economic times, the occupation has attracted a sizable homeless population which has in turn led to tensions at the encampment. But with over 5,000 homeless living around Skid Row and only 3,000 shelter beds in the city, the occupy encampment is one of the safest options for many looking for a place to stay the night. 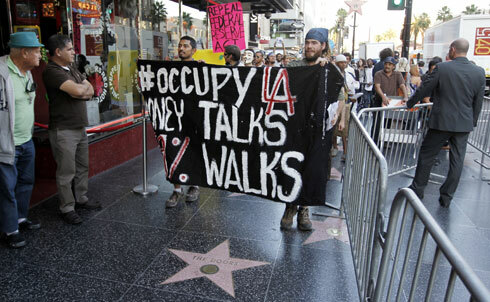 Still, at this point Occupy LA is notable for its small but concrete successes as a movement. After passing a resolution declaring their support for the protests, the City Council is now scheduled to discuss the adoption of a “Responsible Banking Initiative,” which would require the city to divest from corrupt financial institutions. Last Saturday, hundreds of Occupiers and other activists marched through the city’s financial district in support of Bank Transfer Day, a national day of protest that was originally suggested by an Angeleno. 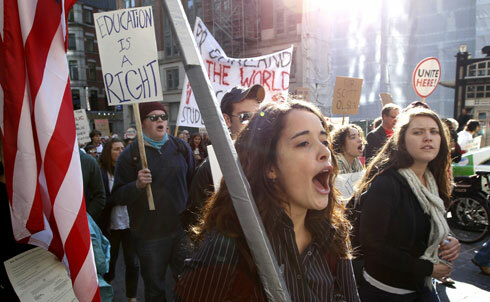 “Because of Occupy LA and the Occupy movement, this country is beginning to discuss a set of issues that it has avoided for years,” Robert Reich said in a rousing teach-in at the end of the event. Let’s hope the conversation lasts. On November 5’s Bank Transfer Day of action, Occupy Seattle called on the City of Seattle to withdraw its funds held in financial institutions that were bailed out by taxpayer money after the 2008 economic meltdown. On the same day, thousands of individuals nationwide moved their money to smaller banks and credit unions. The exact number of new accounts the day of action netted for credit unions won’t be clear for a few weeks, but if all were to score the Boeing Employees’ Credit Union’s one-day record of 659 new members then the operation could be considered a true success. The Comcast action followed the arrest of fifteen people blocking an intersection last month in protest of police brutality. No other Occupy Philly activists have been arrested so far. 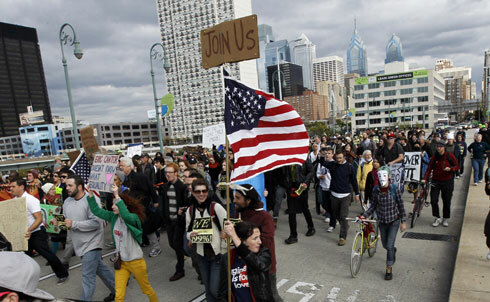 Activists connected to Occupy Philly credit planned marches with driving Bill Clinton and Eric Cantor to cancel speeches (Clinton cited bad weather; Cantor cited the University of Pennsylvania’s inability to restrict his audience to “the UPENN community”). 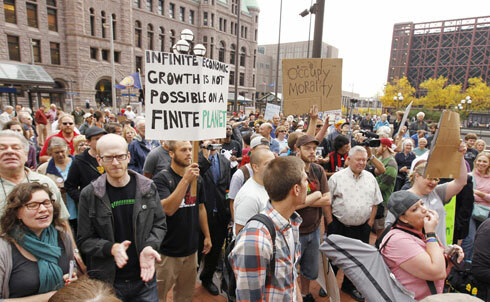 Protesters at the Occupy Minnesota site in Minneapolis—the coldest occupied city in the contiguous United States—are preparing to confront the rapidly dropping temperatures and the municipal government’s rapidly declining tolerance. Their first run-in with law enforcement occurred on October 17, when the occupation was denied the use of tents at “Peoples Plaza” because protesters "are obviously not to be trusted behind closed tents,” joked occupier Erik Foreman. In a cheeky but utilitarian move, activists created transparent tents, but the Minneapolis County Sheriff’s Department still ordered their removal. About seventy protesters, all of whom volunteered to be arrested, formed a human fortress to protect their digs. The officers, in the end, dragged the civil-disobedients away and removed the tents. Three days later seven people were arrested for pitching tents outside of the US Bank Headquarters. This past Saturday night, Atlanta turned into Oakland as protesters marching on Peachtree Street outside the newly renamed Troy Davis Park confronted baton-armed police on motorcycle and horseback. Of the nineteen occupiers arrested that night, two were injured and one was charged with felony assault. This was the second set of arrests since protesters occupied the patch of land in downtown Atlanta formerly known as Woodruff Park over a month ago. On October 25, less than three weeks into the occupation, Mayor Kasim Reed revoked his executive order that allowed the protesters to stay in the park overnight and law enforcement kicked the campers out, arresting fift-two in the process. Since then, protesters have repeatedly tried to reoccupy the park peacefully. 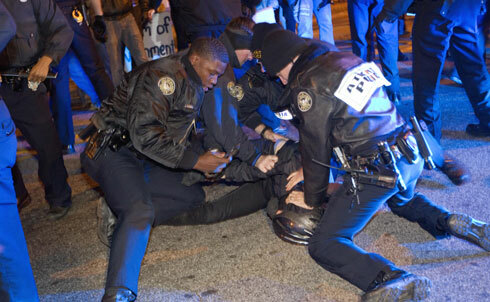 Occupy Atlanta has set up a special account for bailing out those who are arrested. The General Assembly meets daily in the park and 100 to 150 people regularly turn out for marches and seminars. But constant police harassment has made it difficult for the group to focus on several important issues, says Chris Seidl, a graduate student and member of the occupation’s Radical Caucus. Check out the previous slide show for a picture of where the movement was last month, and read more Occupy Wall Street coverage on The Nation’s special section front.